The Cambrian Daily Leader of 18 May 1915 recorded the event. No little bravery was displayed by Sapper T Stroud, of Thomas Street, Llanelly, the previous week in saving a girl from drowning in a river at Bedford, where the Llanelly Royal Engineers, to which the young Sapper belonged, were then stationed. His officers were taking the necessary steps to place his plucky act before the notice of the Royal Humane Society. In September of that year, recorded in the Herald of Wales of 18 September 1915, his family received news that Sapper Stroud had been wounded whilst on active service in the Dardanelles, and that his brother, Private William John Stroud, of the 4th Welsh Regiment, had been killed in the same month in action in the Dardanelles. The South Wales Weekly Post of 14 August 1915 reported Briton Ferry Gunner’s gallant deed. Gunner Arthur Beer, of the 1st Welsh, Royal Field Artillery, was complimented and thanked by the presiding magistrate of the Bedford Borough Sessions for saving the life of a woman who tried to commit suicide in the River Ouse the previous week. 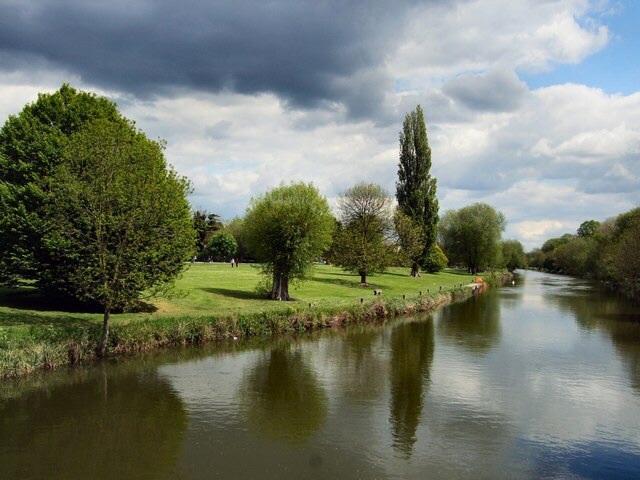 Young Beer, in barracks in Bedford, was walking in the Mill Meadows when he saw the woman make a plunge into the river, and he succeeded in bringing her out. The Chairman said that the manner in which Beer had acted had no doubt saved the woman’s life. Private Beer’s brave action was also reported in the Herald of Wales of 14 August 1915. In Russell Park, Bedford, two men of the 2/1st Welsh Field Company, Royal Engineers, were presented by General Mainwaring, Officer Commanding 2/1st Welsh Division, with the testimonial on parchment of the Royal Humane Society, reported the Carmarthen Journal and South Wales Weekly Advertiser of 20 August 1915, reproducing an article from the Bedfordshire Times. The two men were Sapper s D G Davies and E Rees, both aged 19 years, who, on 4 May 1915 whilst bridge-building at the River Nene, near Nunn Mills, at Northampton, dived in to rescue a fully dressed woman who was struggling in the water. Between them, they kept her afloat whilst men on shore assisted in pulling her out, up the sheer wall on the side. The woman was of big stature, weighing nearly 15 stone, and the rescue must have proved a heavy task for the two men, Davies was only 5ft 5in and Rees 5ft 6in, and both lads were only 19 years of age. The woman was later brought before the Mayor of Northampton and charged with attempted suicide. The Mayor afterwards wrote to the men’s Commanding Officer commending their bravery and intelligence, going into the river at a point where the water was said to be seven feet deep, rescuing the woman when she had become unconscious and doubtless saving her life. The Justices present at the hearing, through the Mayor as their chairman, had expressed their approbation of the conduct of the two men and in addition felt an acknowledgement should be made to the Corps to which the men belonged and to which they had done much credit. 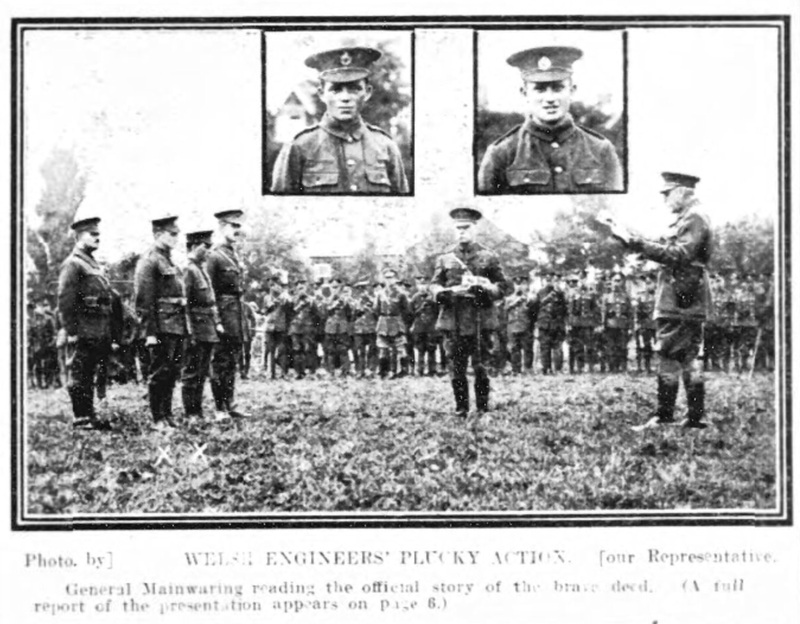 Parties from every unit in the Division and the sappers and drivers from the two men’s company, the 2/1st Welsh Field Company, the Royal Engineers, formed a square at the Park in the centre of which the General made the presentation. There was a large concourse of the public as well. General Mainwaring read a letter from the War Office asking that the presentation should be made in as public a manner as possible, and the official record of the deed, before presenting the certificates on behalf of His Majesty the King. As long as they lived, he said, they would be proud men, and as long as their house stood with these certificates framed above the mantelpiece their children if they had any, their grandchildren and even great-grandchildren would point to them with pride. At the end of the ceremony he and the two men took the salutes of the parties present as they marched past, and the two heroes were loudly applauded.